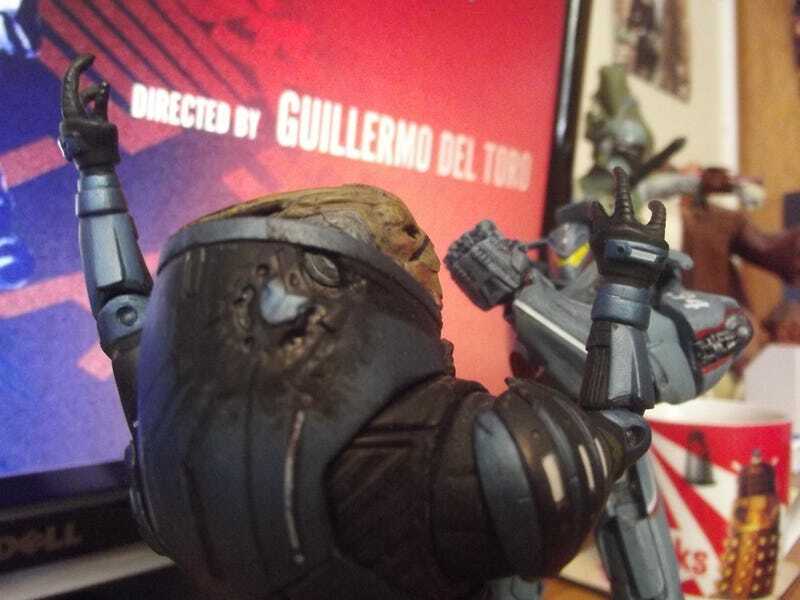 No Gipsy, Garrus is NOT a Kaiju! My Gipsy Danger action figure arrived earlier than expected today. I have the mental age of a 10 year old hyped up on Pacific Rim crack. So... SILLY PHOTOS GO GO GO GO! Grinnah da Goblin is perhaps a little outmatched in this fight. I can exclusively reveal that after long months of speculation, the BBC have unveiled the next incarnation of The Doctor. The Twelfth Doctor will be Charlie Hunnam as Raleigh Becket and Rinko Kikuchi as Mako Mori, as... DANGER WHO! The Cyberiad has a new toy in its arsenal: The CyberJaeger! In general, Gipsy's a great little - I say little, at about 7.75-ish inches, she's quite big for an action figure these days! - figure. Awesomely detailed - apparently with the sculpts lifted straight from ILM's 3D models from the film and then made to scale, which sounds fantastic - with a nice weathering drybrush effect all over, lots of nice paint detailing in her stripes and stuff. My only real problem is that, despite the presence of NECA's usual high standard articulation (ball joints in the hips, head, shoulders, chest, wrists AND ankles - which also have hinge joints for the heels, allowing even greater poseability - as well as hinge joints at the knees and elbows), it's tough to get Gipsy Danger into the more actiony poses. That's not necessarily NECA's fault though, and more of an issue with Gipsy's design. Her hip panels are a little too large to move her legs fully, her Shoulder pads restrict the angle you can swing her arms straight out at, and the biggest problem is her gauntlets, which restrict the elbow hinge's movement down to a teeny amount - below is the maximum you can move the elbow joint forward, which is decent, but it definitely feels like the design is getting in the way.